New York, in 1975, was on the verge of bankruptcy. When President Gerald Ford refused a federal bailout, the Daily News ran the headline ‘Ford to City: Drop Dead’. Parts of Manhattan seemed already to be dying. In the Meatpacking District, the piers on the Hudson River that had once hummed with commercial and industrial enterprise now stood rusting and silent. They were not abandoned entirely, however, as an exhibition at Liverpool’s Open Eye Gallery reveals. Drug dealers, homeless people, runaway children, gay cruisers and prostitutes found refuge in their echoing warehouses and dark corners. Two artists were also hard at work amongst the Westside Piers, and it is their photographs that Open Eye assembles in this exhibition. On the face of it, Alvin Baltrop and Gordon Matta-Clark could hardly be more different. Matta-Clark remains the more famous of the two; son of feted Chilean painter Roberto Matta, he gained international attention at a young age with the large-scale cuts that he made directly into empty buildings. His installation Day’s End, from 1975, consisted of giant elliptical excisions in the corrugated iron walls of Pier 52. Matta-Clark was always on the lookout for sites around New York; his attention was caught by the piers, which, he observed, ‘were all completely overrun by the gays’. This was what drew the bisexual Baltrop to the area. Recently discharged from the Navy, the African-American photographer quit his job as a taxi driver to concentrate on taking pictures of what he called ‘the frightening, mad, unbelievable, violent, and beautiful things that were going on at that time’. Between 1975 and 1986 he worked exclusively in the piers, producing thousands of searingly tender photographs which, until recently, were almost completely ignored by the art establishment. Mainly shot in grainy black and white, they focus on hustlers and their johns, often juxtaposing lithe young bodies with the twisted steel and broken glass of industrial wreckage. 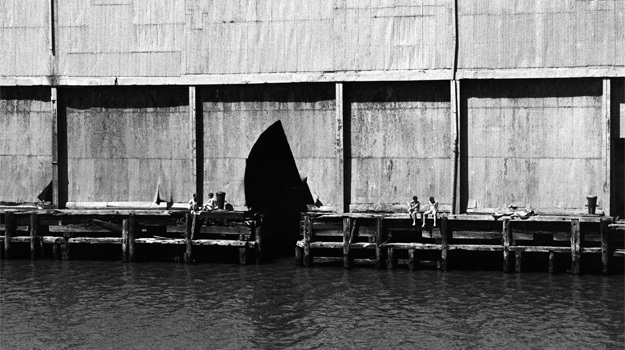 There is no evidence that Baltrop and Matta-Clark knew each other personally, but some of the finest documentation of Day’s End exists in Baltrop’s pictures of naked sunbathers on Pier 52 or of men moving across shafts of sunlight beneath Matta-Clark’s sawn apertures. Thanks to Baltrop’s photographs, an ocean of love and danger, despair and freedom floods back into Matta-Clark’s formal and conceptual gestures. This exhibition reveals how much is lost when we pay attention only to the voices of the historical mainstream.